It’s Fall! The summer humidity has been whisked away on a crisp autumn breeze. Temperatures have plummeted. The days are getting shorter. The leaves are tinted with reds, oranges and yellows. Ahhh, Fall. My favorite season. Half of what I love about Fall are the changes taking place outside, but the other half is the food. Apples, pumpkins, soups and chilis, cranberries, cinnamon, and a great excuse to eat all the comfort foods I love. As the weather turned cooler last week, I was craving something warm and cozy with apples in it. I immediately thought of the hearty and comforting Low-Fat Oatmeal Blueberry Applesauce Muffins I made in the Spring. 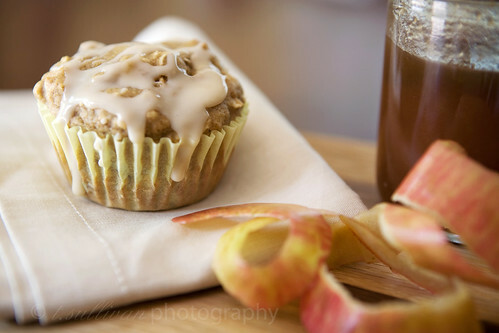 I thought the whole grains, oatmeal and cinnamon would be a perfect compliment to Fall’s first apples. I made a few more changes and additions, and in no time I had warm, delicious, perfectly Fall-ish low-fat apple spice walnut muffins. Like their inspiration, these muffins have a hearty texture. No light fluff here. They’re moist and bursting with apple flavor. To make them a little more decadent, I topped them with a maple glaze. What? I said they were low-fat, not low-calorie! Any oats will work, but use old fashioned or steel cut oats for a heartier texture. Depending on how sweet your apple butter is, you may need to adjust the amount of sugar in the recipe. My apple butter had no added sugar, so it wasn’t overly sweet. 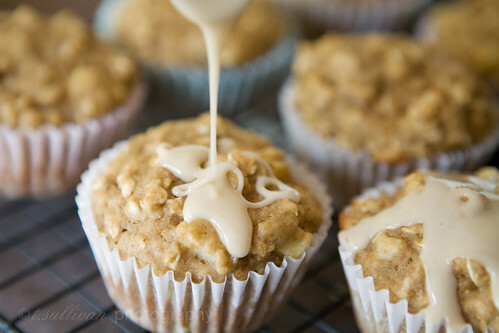 For an even lower-fat and healthier muffin, you can omit the walnuts and the maple glaze. Either way, they’re a delicious taste of Fall. Line a 12 cup muffin tin with paper liners or spray with nonstick cooking spray. If you plan on eating them straight out of the oven, give the liners a spritz of cooking spray so the muffins won’t stick. Whisk together flour, oats, baking powder, baking soda, salt and cinnamon in a large bowl. Combine applesauce, apple butter, buttermilk, sugar, oil and the egg in a medium bowl. Make a well in dry ingredients and add applesauce mixture, stirring until just moist. (Don’t over mix them! The batter will be thicker than your average muffin batter.) Carefully fold in diced apple and walnuts. Divide evenly among 12 muffin cups. Bake at 375°F for 16-18 minutes, or until a toothpick comes out clean. Cool on a wire rack. Combine the maple syrup, sugar, and vanilla in a small bowl until thick but pourable. Drizzle on cool muffins and allow to harden at room temperature. These look awesome – especially that glaze on top! These look incredible and I love how healthy they are! Nom Nom Nom these are tasty. These look delicious. My friend and I were just lamenting the lack of tasty low-fat baked recipes–definitely going to try this soon!